What if the mythical creatures known as dragons actually existed and emerged from a state of dormancy to wreak havoc on the modern world? That is the high concept behind "Reign of Fire", the latest effort from Rob Bowman, director of the "X-Files" movie. Mixing "Dungeons & Dragons"-inspired fantasy with "Mad Max"-style post-apocalyptic science fiction, "Reign of Fire" achieves mixed results, with a great premise and a few memorable action set pieces being bogged down by comic-book characterizations, unintelligible dialogue, and the limitations of the film's modest budget. The story kicks off in the present day where a young boy named Quinn Ambercromby witnesses the accidental discovery and awakening of a real fire-breathing dragon in a London subway construction site. Fast forward to the year 2020, and human civilization has essentially been reduced to ashes, as the dragons have quickly increased their numbers to three million and become the dominant species on the planet. A much older Quinn (Christian Bale of "Captain Corelli's Mandolin") now leads a rag-tag group of survivors in a small stronghold. Unfortunately, like humanity in general, Quinn's settlement is on the verge of dying from starvation-- that is, if the dragons don't burn them to a crisp first. However, a small glimmer of hope comes with the arrival of a small contingent of Americans who have flown across the Atlantic in one of the few remaining airplanes. They are led by the tough-talking and cigar-chomping Denton Van Zan (Matthew McConaughey of "U-571") who claims that the dragons can be killed, and he has done so successfully in the past. Backed by some impressive military hardware, including a helicopter, Van Zan plans to travel to London to end the dragon infestation once and for all. Apparently, all the dragons are female and there is only one male member in the species. Kill the male, and there will be no one to fertilize the next batch of dragon eggs, thereby wiping them out when the current generation dies off. Unfortunately, Quinn doesn't have a say in whether or not his group will participate in such a bold plan, which could potentially backfire and kill them all. The dragons in the film are brought to life by the extensive use of CGI and do look impressive, particularly when Quinn's settlement is attacked by a dragon or during the film's final showdown where Quinn is face-to-face with one of them. The production design is equally impressive, with the surviving humans using whatever technology that they have been able to save, and the rest of the country, such as the road to London, clogged with scorched debris. Unfortunately, given the film's relatively modest budget, moviegoers will be disappointed by the lack of any large-scale battles between man and dragon. Most of the confrontations are one-on-one and there is little opportunity to show off Van Zan's collection of military hardware in action. Even a montage sequence showing twenty years of destruction by the rapidly reproducing dragons relies on stock footage and newspaper clippings to document the devastation and the collapse of human civilization. Even more disappointing is how the dragon phenomenon or the workings of a devastated world are glossed over by the film's script. Though a few intriguing details about the dragons are provided, such as how they emerge every few eons to exterminate life on the planet (including the dinosaurs) and how they use their 'natural napalm' to create ash, which is what they feed on, these are generally lacking. The same goes with what is left of humanity in the face of such a global disaster-- there is mention of roving bands of marauders and an amusing sequence showing how "Star Wars" has evolved into their mythology, but few other details are provided. Another problem is how unintelligible the dialogue in the film is. The English characters all speak with thick accents, while the American with the most dialogue, Van Zan, speaks with a hoarse voice and always has a cigar in his month, making his lines difficult to understand. Mind you, being able to understand the dialogue tends to be a moot point, since most of the film's characters end up being flat. The characters of Quinn and Van Zan, ably backed up by Bale and McConaughey, are probably the most fleshed out in the film, though they still end up being archetypes, with the former being the scarred and ineffective leader and the latter being the madman blinded by his own hubris. The rest of the cast is relegated to even more one-dimensional roles, such as Izabella Scorupco ("Goldeneye") as helicopter pilot/love interest Alex, Alexander Siddig ("Star Trek: Deep Space 9") as a radio operator, Alice Krige ("Star Trek: First Contact") as Quinn's mother, and Gerald Butler ("Dracula 2000") as Quinn's ever-loyal right-hand man. 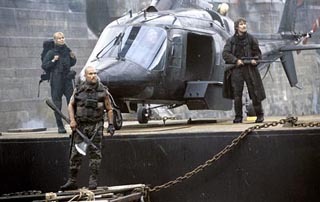 Comic-book cinema certainly rules the day in "Reign of Fire". Though it offers a fascinating story and some monster-movie special effects, it also suffers from a dearth of details, small-scale spectacle, and generally uninteresting characters. At best, "Reign of Fire" ends up being a guilty pleasure, a special effects-laden popcorn flick for passing the time on a hot summer night. Images courtesy of Touchstone Pictures. All rights reserved.